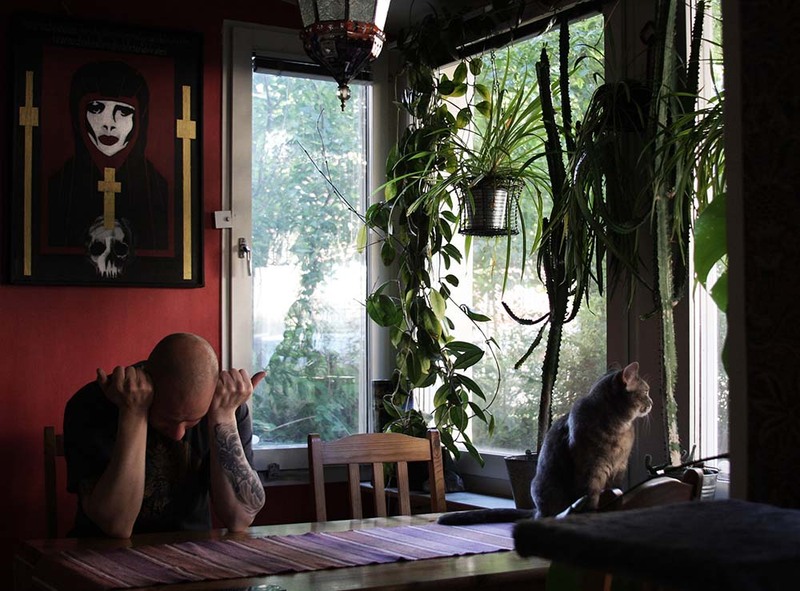 Sonically disillusioned, Kaamos veteran Konstantin had stowed away his guitar and went on with his life – until one day in 2011 when he was flooded with a creative urge that forced his hand in composing music he’d never imagined himself playing. Five years later and Head of the Demon’s second album is now upon us – recorded live in analogue and featuring an actual curse. 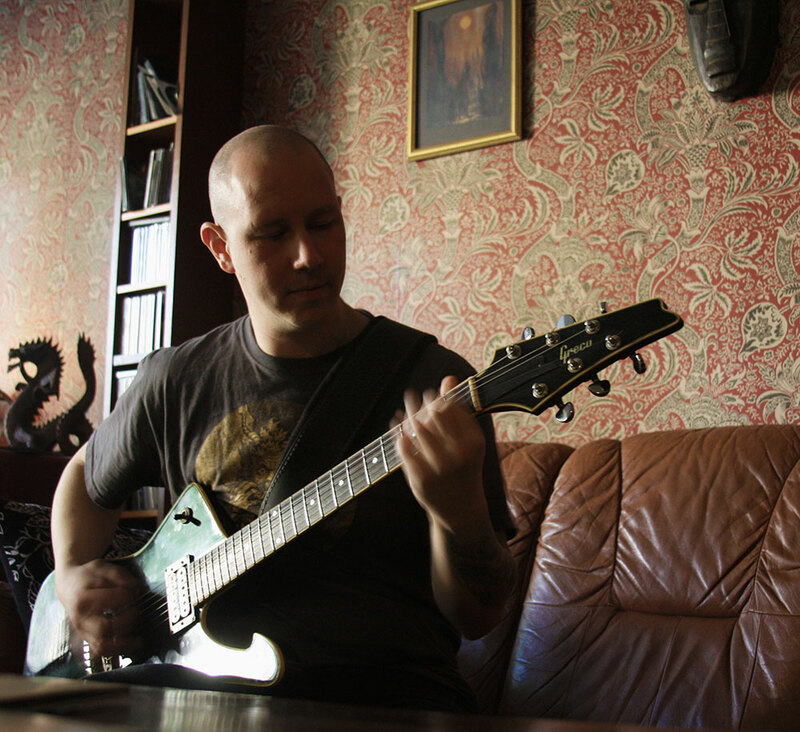 – After KAAMOS split up in 2006 I was part of founding SATURNALIA TEMPLE (Swedish esoteric stoner/doom), says guitarist and founder Konstantin Papavassiliou, it was an attempt at creating something new. All the while, the seed of what later became HEAD OF THE DEMON had already been planted and kept growing – hidden from view. August 5, 2008 – surprising many at the time, KAAMOS made a reappearance as the supporting act to the reunion gig of Swedish black/death metal relics UNANIMATED. 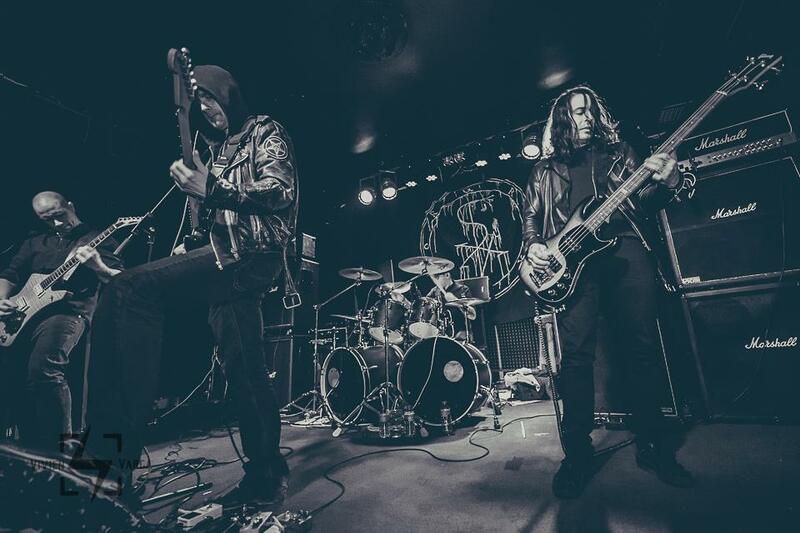 – KAAMOS had already been put to rest but when their drummer Peter Stjärnvind (BLACK TRIP/ex-NIFELHEIM, ENTOMBED) asked us to play I couldn’t say no – UNANIMATED were a very formative band in my youth. The gig inspired us to keep playing and we started putting together what was shaping up to be our third record. A trinity of albums had always been my goal, perhaps not entirely uninspired by ORDER FROM CHAOS. Why this never came to fruition isn’t something Konstantin is particularly talkative about, simply stating that distractions and lack of time outgrew the will to keep going. – I decided to kill it once and for all, before ending up with something we’d regret for the rest of our lives. There’s still plenty of material from that period, six or eight songs that were never properly recorded. And I don’t suppose there’s any chance they ever will? – No, he states resolutely. Having left SATURNALIA TEMPLE already, the re-demise of KAAMOS left Konstantin utterly fed up with the metal scene, playing music and pretty much anything that had to do with either. He discontinued his musicianship entirely until one day in 2010 when, despite having barely touched his guitar for months, inspiration struck like a lightning bolt. – I woke at night from sheer frustration, as if suddenly haunted by a violent and uncompromising creative urge. I sat down on the couch with my guitar and started churning out riffs in a style I’d never played before. I was genuinely surprised and became determined to figure out what was going on. Soon sensing that he’d come as far as he could playing solo, Konstantin decided to explore it further by assembling a line-up to jam the material with. His first call went to Thomas Åberg (ex-KAAMOS, A MIND CONFUSED), who’s now been HEAD OF THE DEMON’s drummer since day one. – We grew up together and he’s played in pretty much every band I’ve been part of. I asked if he was up for trying something completely new – which he was, so we started rehearsing and piecing together the material that later ended up on the debut. Konstantin wanted to capture the feeling of playing in an empty church and as such started mapping out the audible spectrum in search of his sacral soundscape. His pursuit began with the guitar tuned all the way down to B, massive amounts of distortion and only a little reverb. – Little by little I tuned up to E, got rid of most of the distortion and then focused on reverb and delay; all of a sudden we’d found our way and this really elevated the material. Another idea I had was that I wanted us to be more like an orchestra than a metal band, if you get my point. – I mean that the symphonic totality must be greater than its individual parts. When all instruments resound in harmony, there’s an orchestral quality that draws one’s attention from the details to the atmosphere – and this is of the utmost importance to us. Something that certainly contributes to the atmosphere is the rather unorthodox song arrangements. – It’s not so much conscious design as it is something that happens organically. We’ll often construct songs from separate pieces, not entirely unlike classical music or soundtracks. The purpose is to distribute equal importance over the composition’s individual fragments, rather than some parts serving no other function than bridging verse to the kind of hit chorus that commercial music aims for. – There’s not much rational thinking behind it. I think the purpose should be like painting a portrait with your music; can a riff be written and arranged to sound truly haunted? How does paranoia translate into tunes and what’s the melody of a freezing wind? Etcetera. The duo recruited a vocalist known only as Saibot and booked the studio for September 2011. As they prepared to record, actually finishing the songs was the most pressing matter. In order to mould them after Konstantin’s vision they were arranged and then re-arranged again – until all pieces of the puzzle were soundly in place. – They were brought into this reality as voices wanting to speak and be heard – a current, a daemon; an intelligence or whatever you want to call it, seeking to manifest. We provide a vessel in this plane of existence, so it might gain entrance from the void in which it dwells. I’m curious as to how one should genre-classify sorcerous sonic solicitations. – For lack of a better term I call it ‘deadly black doom’. I don’t know why but somehow it encompasses what we’re about, leaving it open for what we strive to become. The self-titled debut was released one year after they began recording it – September 2012, with the LP edition handled directly by the band. – I‘d planned it that way from the start – I wanted to rehearse and record an album, then release it on vinyl. Every aspect of the studio work right down to the mix was carried out with this format in mind. The CD version was distributed by American label The Ajna Offensive, who have now collaborated with Ireland’s Invictus Productions to release the latest album on all formats. – I’m very pleased with our collaboration thus far. Tyler (Davis, label manager) and I got to know each other through KAAMOS and then SATURNALIA TEMPLE. At some point after we’d founded HEAD OF THE DEMON he asked me if I was still writing music – I mentioned having a project going but left it at that. Konstantin promised to send him samples once they had something to show. I was curious what the label manager’s first impressions were, once this happened. – Everything about it was perfect, Tyler Davis reminisces, it wasn’t over-produced and sounded really unique – BLACK SABBATH meets MORTUARY DRAPE with a bit of VENOM thrown in. The instruments sounded almost medieval and left plenty of breathing room – it was the complete opposite of everything else I was hearing at that time, in the best possible way. I also knew it wasn’t play-acting; Konstantin and I have been in touch for ten years so I understood where he was coming from to a certain extent. Today’s line-up also includes bass player Jose Dominguez-Lopez and Johannes Kvarnbrink (MORTUUS, OFERMOD) on guitar and live vocals. – I have a riddle that needs answering before anyone is allowed to join; if you had to choose between losing your sight or your hearing – which one would it be? All of the involved have answered correctly. In November 2015 they were preparing to record new album ”Sathanas Trismigestos”. – After rehearsing so much we’d gotten really tight as a band. We discussed the best way of channelling into recording that energy the four of us playing together generates. They came to the conclusion that the best way to capture their cooperative chemistry was to record it live. – I mentioned it to Tyler who thought it was the right way to go and several other people I trust concurred. Top Sound – the studio we use, has worked this way with blues bands many times before and the engineer liked the idea so we went ahead and did it. The studio had an old tape recorder and after some deliberation, they decided that since they were recording it live they might as well go analogue. Who is Armilus and why was he riding in the first place? – He’s an anti-messianic figure in Jewish eschatology who rode to suppress a revolt in the beginning of 600 CE. According to certain interpretations he’s ridden under different names many times since – and now he rides again. I sense that the album title speaks of someone from the same social circle. – The title “Sathanas Trismegistos” is my own invention. Lucifer, Satan and the devil; thrice in one entity – this is my take on these entities, garnered through 18 years of dedication to the Draconian Tradition. The ‘Draconian Tradition’ is the foundation of Dragon Rouge, an initiatory magical order founded in 1989 by Swedish esoteric author Thomas Karlsson. Konstantin confirms that he’s been an active member since the nineties, though declines to elaborate further about his role in the organisation. – It’s best to simply refer to the website, there’s more information there than I can provide here. Fortunately, he’s more open to discussing his personal views on the proverbial left-hand path and its methodology. – First off, one must separate magic such as sorcery and related practices from the tradition I’m involved in – which is initiatory. By sorcery, you are referring to curses, spells, conjuring …? – Yes. I am somewhat skilled in this but most of my studies are dedicated to invocation, evocation and meditation. I’ve utilised sorcery to solve certain tasks, though never anything that I would’ve been able to take care of myself – that’s my rule of thumb. Speaking of which, the fifth song of the new album is called ”Maleficium” – a Latin term used for acts of magic with the express purpose of causing harm to either people or property. Come to think of it, the lyrics themselves look suspiciously like a curse. – That’s precisely what they are, he confirms, I struggled over a year’s time with the lyrics for that song. That’s impressive, considering that the average vacation postcard is like to have a higher word count than most of their lyrics. – Well, yes – a perfect example of how the intelligence behind HEAD OF THE DEMON works. The simplest of tasks become the biggest mountains to climb, while the tallest peaks are conquered with minimal effort. At one point he simply gave up on it, until guitarist Johannes pitched the idea that they should use the song to curse a mutual enemy. – I got excited by the idea and started working on it to see if it could carry water. I finished it within a day or two, taking the trail across one of those conquerable peaks. Needless to say, one is curious as to the malediction’s efficiency. – By the time we were in the studio it had unquestionably started to work and by now I believe it has run its course. I’m not going into its purpose but suffice it to say, I’m pleased with the outcome. As is usually the case with magic portrayed through metal, his attention seems to be oriented towards the dark and destructive end of the arcane spectrum. – Yes and no – my interest in the restorative arts is primarily from a perspective of knowledge but I have practiced some healing. Having just uttered the dreaded word ‘healing’, he swiftly stresses the importance of dispelling any mental images of him wearing amber necklaces, wielding crystals while analysing aura photography. – Definitely none of this new age business, just so we are clear on that – more along the lines of indigenous shamanism. Over a decade ago I studied literature like Carlos Castaneda, learned about shamanic practices in South America and how it’s connected to the plant kingdom and its genii. Why does one practice magic? I mean – is it for the betterment of yourself or others, to alter the world itself or to simply experience something otherworldly and profound? – Good question, though you’ll probably find as many answers as there are practitioners. In the very beginning, most people just want to see if it works. As time rolls on they’ll either become content with what they’ve managed to figure out or delve deeper into the actual tradition of magic. Konstantin claims that adepts taking the latter path will eventually realise that besides having scientific strands, magic is an art which power never surpasses that of the artist. – It’s when you come upon this revelation – not rationally but instinctively, that you comprehend the range of possibilities that magical work offers. Changing the course of the world; dethroning the demiurge or burning the gods of man with the light of a new deity. New temple, new dawn or new man – just state your preference. He attributes his own spiritual progress entirely to the study of magic, both as an academic science and as abstract art. – The draconic alchemy transforms you on a fundamental level, pulling you into states of consciousness that few people will either know or glimpse. The journey so far has been marvellous, terrifying, wrought with peril but also full of laughter, joy, ease and everything in-between. Laugh and go about the world as a devil, they say! Prominent American horror author H.P. Lovecraft appears to have been another vast source of inspiration. – The Cthulhian theme is pretty isolated to the debut. People have mistaken it for homage to the writer and his stories, but it’s not. Lovecraft is one of my all-time favourite authors but enough has been written and dedicated to him as a person. Instead it was what the novelist hinted at and wrote about; of elder gods and of the ancient ones – how tiny a creature man is before the primordial forces that dictate our existence. – Cosmic dread – the eeriness of death and what lies beyond; that’s what the debut deals with under a mostly Lovecraftian guise. One would think that a band that places emphasis on a genuine dedication to occultism would want to avoid blending it with fiction. Which of the idols being invoked are myth and who is supposedly real? If part of the concept is openly make-believe, the same could very well apply to the rest. – It depends on how you view it but I don’t think so at all. Take Aleister Crowley, Dion Fortune and Kenneth Grant – highly prolific writers on occult theory and practice, and yet all of them wrote fantastic novels. Using fictitious storylines, this literature allowed them to describe the craft in a more liberated manner than in their theoretical books. HEAD OF THE DEMON is the literal translation of the Arabic word ‘ra’s al-ghūl’, the name given to the mythical ‘demon star’ Algol. Some would view this as another fine display of the current scene prevalence of drawing conceptual influences from various Eastern theological sources. – I think it’s got to do with all the new and previously unexplored areas that are suddenly available to bands that go looking for something obscure to boost their image with. The Orient has historically held an exotic and mystical vibe for westerners. – The west, being in a postmodern age and in a steady decline from focusing on materialism, doesn’t produce many mystical or esoteric ideas – only consumerism. Perhaps it’s also simple psychology – man will usually look farther than he needs to, only to realise that what he sought in the first place was in his backyard the entire time. – Invictus Productions released “Sathans Trismegistos” in Europe on Walpurgis Night (April 30) and The Ajna Offensive in the US on May 20. We’re also playing in Stockholm with REVEAL and CULT OF FIRE on September 3, which I very much look forward to. Hopefully, more stuff will keep coming our way.